Yesterday we watched the 2010 film Conviction, based on a true story, with Hilary Swank as Betty Anne Waters and Sam Rockwell as her brother “Kenny” Waters. This called to mind several similar films I’ve recently seen, including The Hurricane (1999), and American Violet (2008). 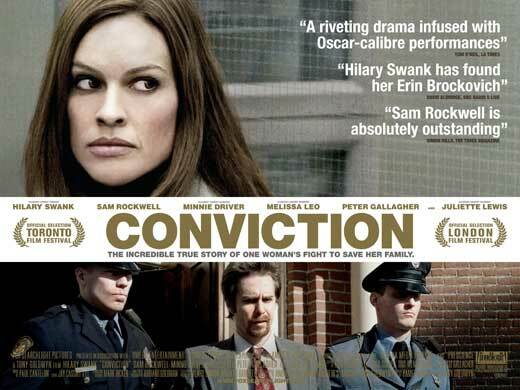 Conviction is an extremely powerful film, so much so I had it fresh on my mind upon awakening. My morning ritual includes reading the paper (the actual paper, not the cyberspace version) and, lo and behold, after scanning the baseball scores (the Dodgers won again! ), I landed on an article about a new national database tracking wrongful convictions since 1989. I suppose this falls under the heading of serendipity or synchronicity. I’ve pasted the entire article below, followed by a list of titles that help us begin to make sense of the disturbing number of (both documented and unknown) wrongful convictions. In other words, these books should enable us to better understand the possible reasons for the incredible number of wrongful convictions in our adversarial criminal justice system.